Hold up! 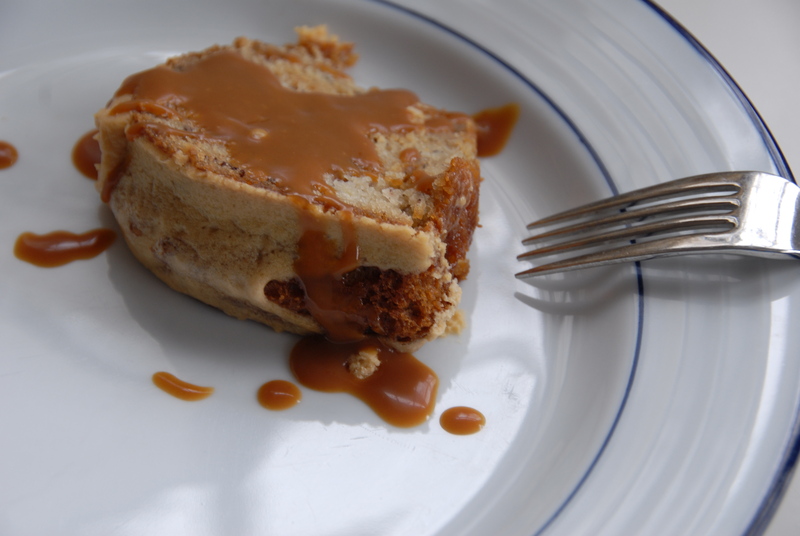 Before you rush off to your long weekend check out this amazing banana caramel cake! I had a chance to escape back to my hometown this week and I knew I wanted to make something delicious for my sweet-loving sister. She’s a total nut over caramel so I turned to a recipe I found on theKitchn.com awhile back for a little banana/caramel goodness. Holy moly it was tasty. I couldn’t tear myself away from the caramel buttercream – eating it by the spoonful (hey, it was Mardi Gras!). Why not make it for your sweetie… keep those Valentine’s Day vibes goin all weekend long! 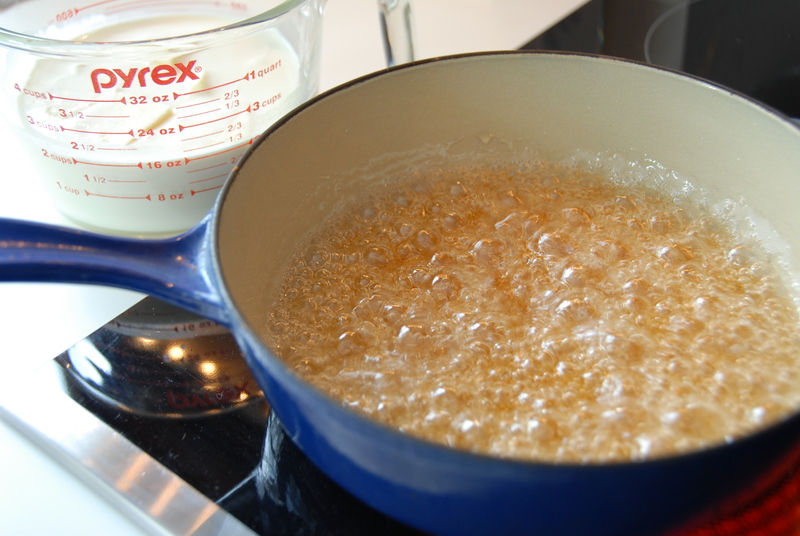 Place the sugar and water in a large heavy bottomed pot on high heat. Allow it to bubble and boil away until it starts to turn yellow and then to a dark amber. Don’t be tempted to pull it off the heat before it gets nice and dark or your caramel won’t have that rich burnt-sugar flavor. This will take anywhere from 8-12 minutes. Just stay close and keep an eye on it! 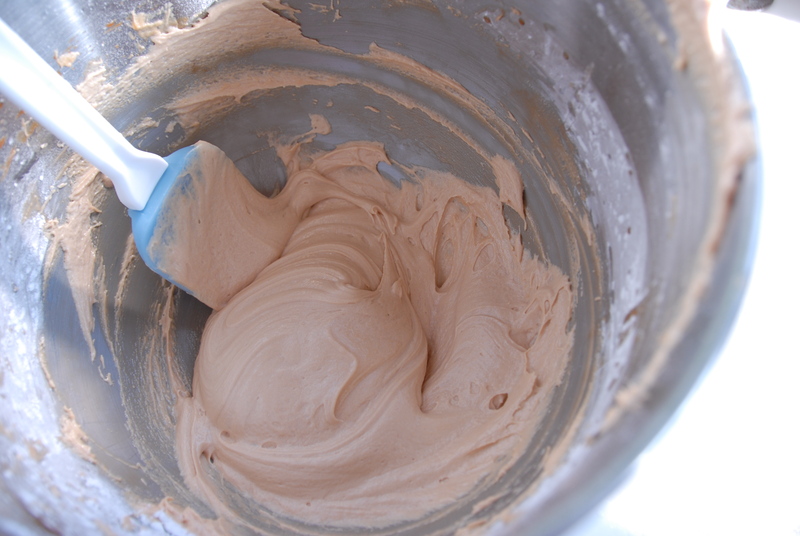 If one side of the pan starts to get darker than the other gently swirl the pot until the coloring becomes even. Once you have the deep amber color carefully (!) pour in the cream followed by the butter and salt. Whisk vigorously. 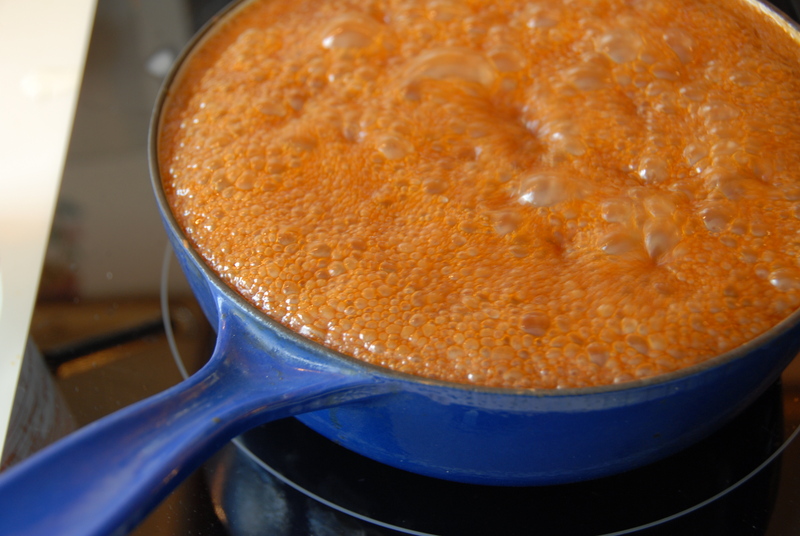 It will bubble up initially but don’t worry – keep stirring until it’s silky smooth. Reduce the heat and simmer for another 5 minutes. Take it off the heat and cool. You’ll need this for the cake, buttercream and as a topping but it makes plenty – bonus: it’ll keep in the refrigerator for about two weeks. Woohoo! Preheat oven to 325°F. Grease the bundt pan really well. Cream the butter with the white and brown sugars until fluffy. Add the eggs and beat one by one until combined. 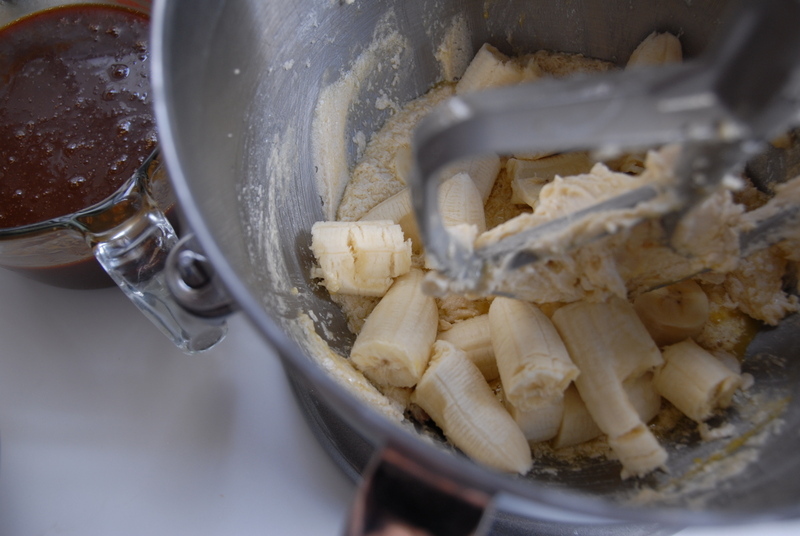 Add in the mashed bananas and beat until incorporated. In a separate bowl, whisk the flour with the baking soda and salt. Whisk the milk in with the vanilla add to the bowl alternating with the flour in 3 additions, beginning and ending with the dry ingredients. Beat just until smooth. 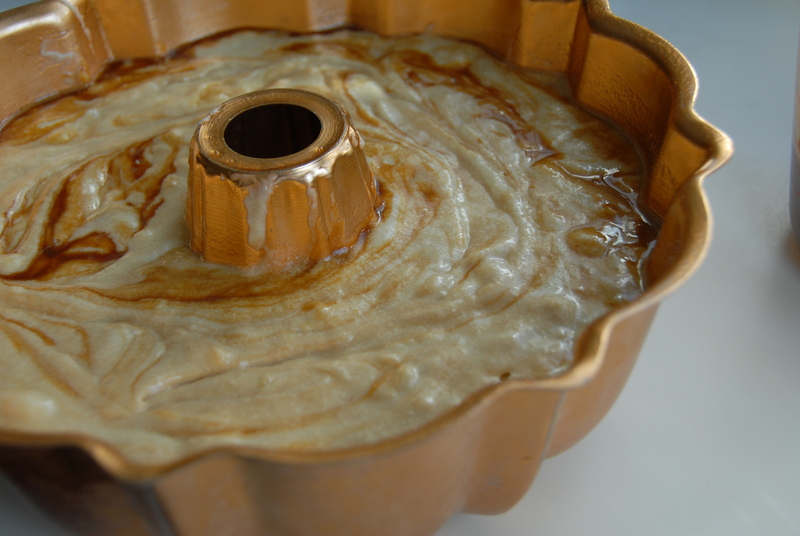 Pour batter into the bundt pan and swirl about a 1/2 cup of caramel into the batter. Bake for about 40 minutes or until the cake comes away from the sides and the center is cooked through. Cool on a rack. 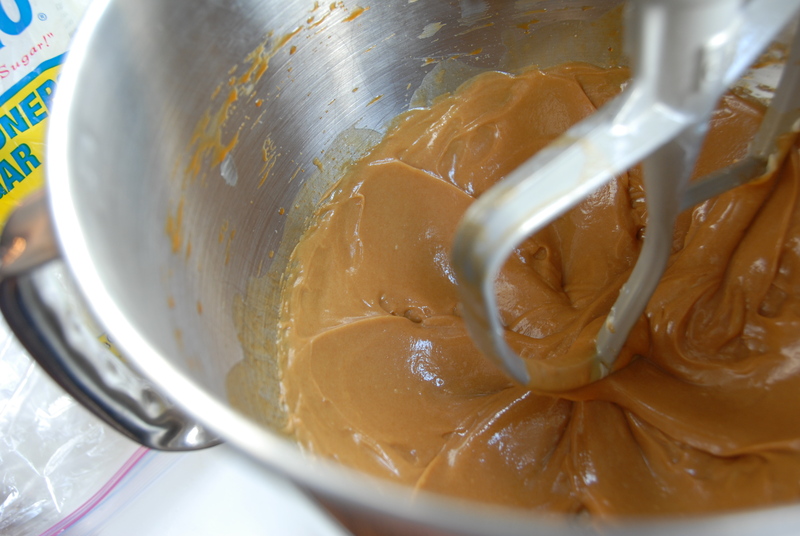 In the bowl of a stand mixer (or in a large bowl using a hand mixer) cream the butter with the caramel sauce, vanilla, and salt until very smooth. Slowly add the powdered sugar and beat for at least 5 minutes until very smooth and lightened. This frosting is killer. I’m surprised there was enough left to ice the cake what with all my “tastes.” Once the cake is completely cool pile on the frosting and dig. in. 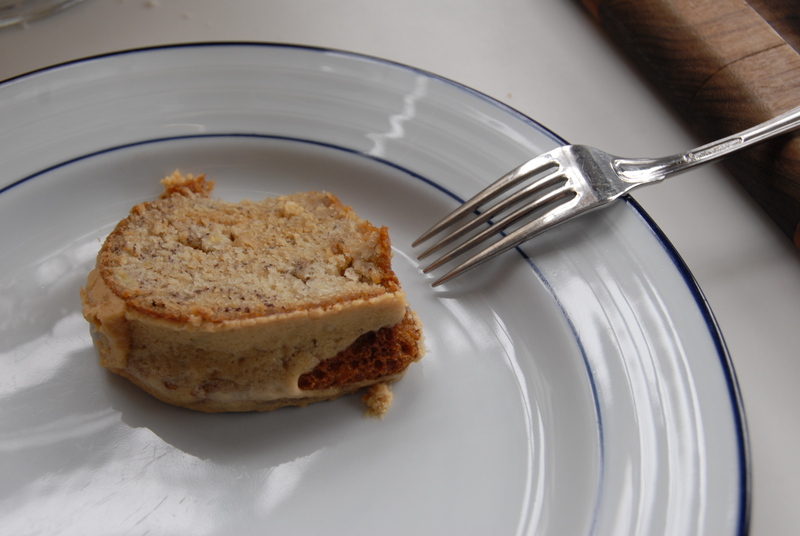 With a wonderfully banana flavor and seeing as it’s not too sickeningly sweet my sister noted this cake is really quite good for dessert AND breakfast (simply add or leave out extra caramel, see below). I would have to agree. This entry was posted in Bananas, Butter, Cakes & Pies and tagged banana, bundt, cake, caramel, caramel sauce, valentine's day. Bookmark the permalink.